WhaleHelloThere, We invite you to enter our Winter Whale contest for a chance to win $100 towards a Cape Cod or Islands vacation house or a great local meal. Each Wednesday we will post clues as to where on our website to find our Winter Whale. 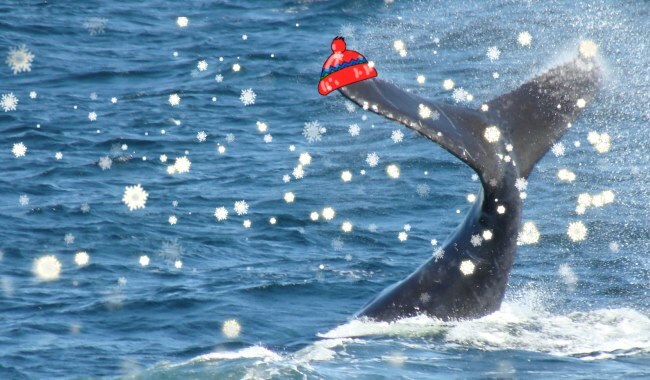 Our Winter Whale, Capella, wants to swim to Nantucket to buy a new whale belt and stay in a vacation rental. Can you help her find a house? Follow the yellow tab road for a Guide to your future vacation. The whale was found on the Guide to Cape Cod page. For a whale of a good time, visit these sandy beaches between Sandwich and Brewster. The whale was found on the Mid Cape Cod Beaches page. Each Wednesday for three weeks we’ll post a clue on this page, Facebook, Twitter and Pinterest hinting where to find the “Winter Whale” on the WeNeedaVacation.com website. You are welcome to search each week to find the whale; we will move the whale 3 times. The more you search and find, the greater your chances to win! Head over to WeNeedaVacation.com, and using the clue, search for the “Winter Whale”. Once you’ve found the “Winter Whale”, click on the image to enter the contest! Share that you entered on Facebook, Twitter or Pinterest with #whalewatching in your message. At the conclusion of the contest, one winner will be randomly chosen to win $100 towards a Cape Cod, Nantucket or Martha’s Vineyard vacation rental house or restaurant as well as a WeNeedaVacation package of goodies. Good Luck!